New tires and wheels arrived last night. As I said in a previous post, the wheels are TRMotorsports C1M bright silver wheels, and Fuzion ZRi 205/50R15 tires. 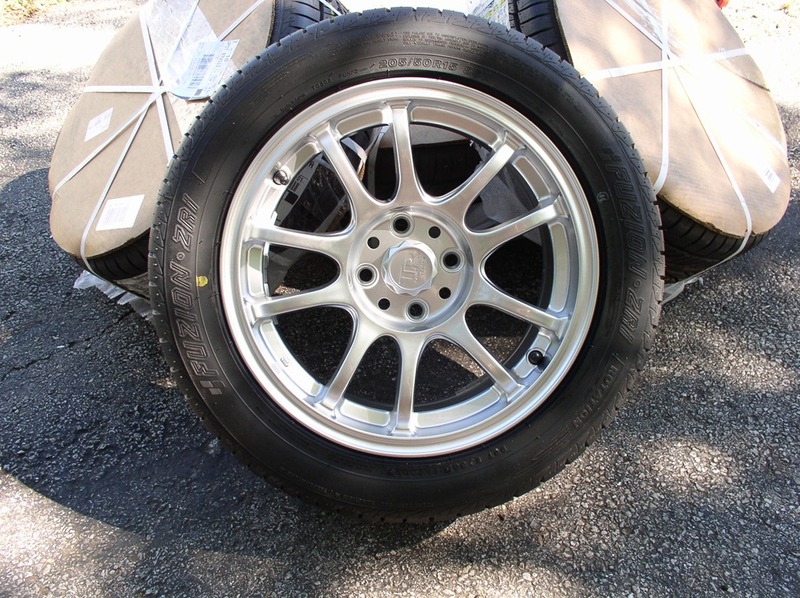 The wheels are spec miata legal 15” x 7”, with a 30mm offset, and weighing in at 13.2 lbs. The tires are a Ultra-High Performance street tire. I went with these because they are half the price of either Extreme Performance or R-comp tires. The stock wheels are 14 x 4 1/2”, and stock tires are 185/60R14. These new tires are taller and considerably wider. In addition, the stock offset is bigger. So, the track of these wheels/tires pushes the tire right out to the fender. In order ensure the tires fit and don’t rub, it is necessary to “roll” the fender lips. It actually turns out to be very easy. And all these pictures probably aren’t necessary. However, when I started thinking about doing this, I couldn’t find anything on the web other than a couple posts on specmiata.com. The both, basically, said get out a hammer and bang on it until it is rolled under. That is essentially what you do. Nevertheless, seeing what you are going to do ahead of time makes it clearer what you are about to do. Ok, so..I bought a set of tr motor sports c1m silver wheels. I also purchased a a set of fuzion ZRi 205/50 r15 tires. These are spec legal wheels and performance street tires. 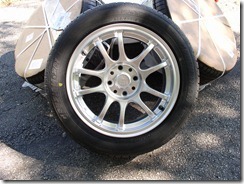 The wheels are 30mm offset…min legal bring 25mm. In addition, I bought a set of race pedals from SRP racing. My brake pedal is about 1/2 in below my throttle, which makes heel toe tough. With these I can insert spacers between the pedal and the plate typo adjust the heights. That should make the car trackable.